So on Saturday morning, there we were, eating our breakfast, when the phone rang. It was the lovely neighbours next door, saying they had a slight problem. There was a badger, stuck on their patio and not moving. Did we have any ideas on how to get it off the patio? Ever since we moved into our house we’ve known there are badgers in the garden. We can see their trails over the grass, and there’s evidence of them all over the place, but we’ve never managed to actually see them, despite extensive stake outs in the gardens during the summer months. So we jumped at the chance to go and see one in real life. 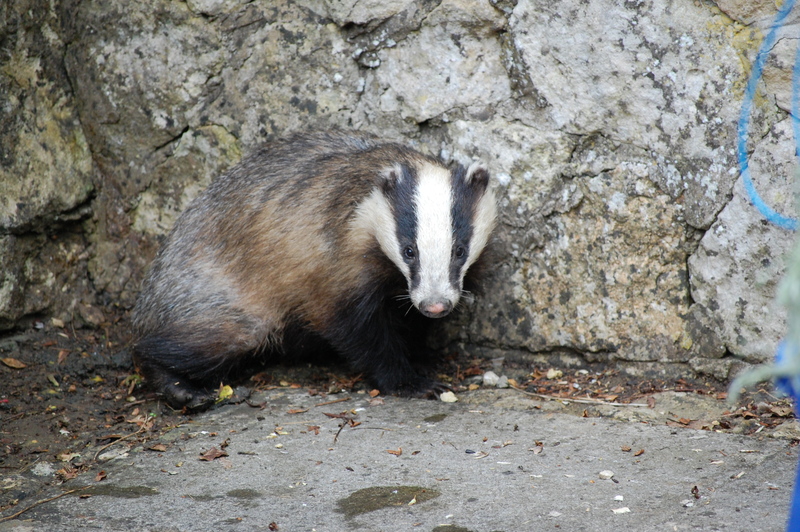 Off we all traipsed next door, and the badger was looking very sorry for itself, shaking in the corner of the patio. The Badger Trust had been called, but they were over half an hour away and needed to get up. It had probably come down from the top of the garden, so we thought if we could direct it back it would be much happier and could just move off. But Badger didn’t want to move. At all. Despite the husband building it an extensive and impressive ‘Badger Run’ to guide it, using board and garden chairs. (You shouldn’t ever go too near badgers, as they can be a dangerous). Eventually the people from Badger Trust arrived, carrying a cage and a loop on a stick with which to capture it. I don’t know what I was expecting, but I was slightly surprised to see them rock up in normal clothes in their Ford Focus. Anyway, the second they got near the badger with the cage, he regained all mobility, darted around the crowd of people on the patio, and sprinted off at speed. The Badger man was not happy, declaring it to be the first that had ever got away from him. We had a good look around, but couldn’t find the badger, so fingers crossed he was fine and made his way back to the sett. The Badger Trust people then left to see an American raccoon that had been captured not too far away. Trufax. So all in all, a rather entertaining Saturday morning. ← Baby Badger Goes Dutch!